The rioting discussed in the last post has actually been nationwide, leading us to look for factors against the USA chart as well as Baltimore, at the start of the violence. Transiting Saturn, ruler of transiting Pallas, septile transiting Pluto; transiting Pluto novile US Pallas and sextile progressed Pallas: national ethical crisis. Transiting Pluto opposite progressed Jupiter in Cancer: Plutonic destruction and racial ideology (Jupiter in Cancer). Transiting Uranus conjunct progressed Chiron in Aries in the Fourth House: unrest (Uranus/Aries) regarding racial (Fourth House) wounds (Chiron). 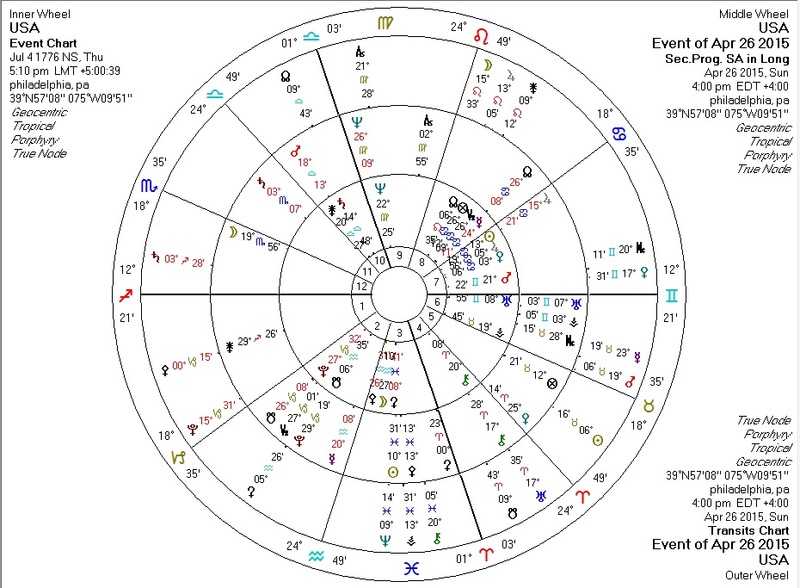 Transiting Saturn quincunx US Venus in Cancer: where in previous posts this has related to immigration policy, here it can also reflect strained (Saturn) race (Cancer) relations (Venus). Transiting Vesta conjunct progressed Pallas: I don't know what Vesta does, but certainly this suggests that ethics (Pallas) are highlighted.